So, I’m down with a cold, which is a shame, because now our activities are fairly limited. Also, we have no reals, and I’m half thinking that we can try to do this whole trip without changing any reals at all. 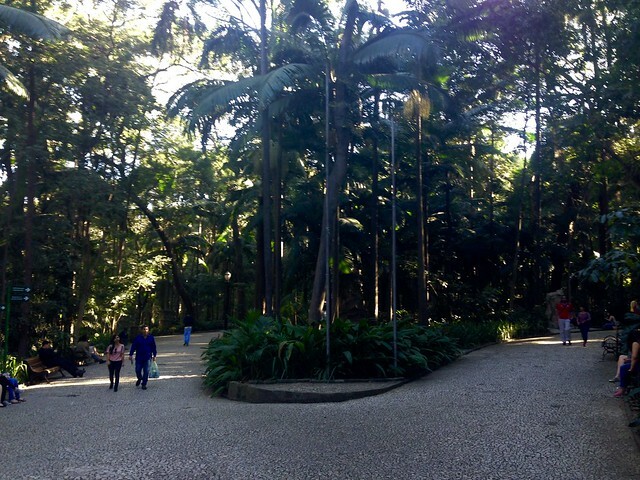 After reading some stuff on wikitravel, I decided that Avenida Paulista is the perfect strip for our one and only exploration of Sao Paulo. Avenida Paulista stretches quite a number of neighborhoods, and encompasses some old architecture, nice little city parks, shopping, business, the works. Without reals, we used Uber, and we called an Uber to drop us off at the Museum of Contemporary Art. The +1 didn’t wake up for breakfast, so he was starting to get hungry. We walked into a mall, and headed up to the top floor, where we found a food court, which was very busy with the lunch crowd. 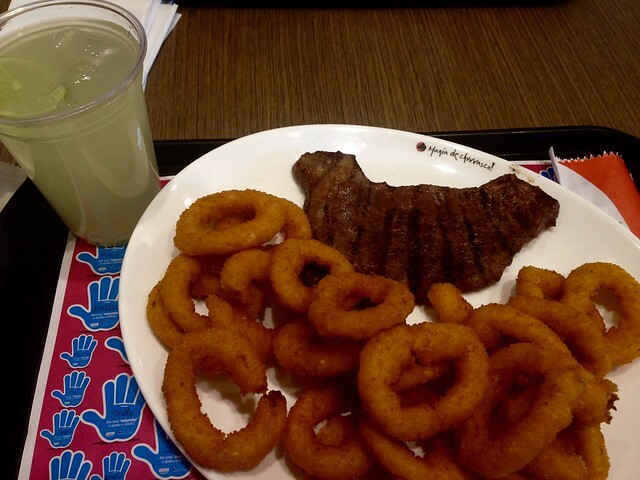 I ended up getting a steak for $4, which I can’t complain too much about, mostly because it’s $4. For the fans of Havaianas flip-flops, it’s an urban myth that they cost $2 in Brazil. But they do just cost $10 in Brazil, if you are looking to score some cheap(er) Havaianas. 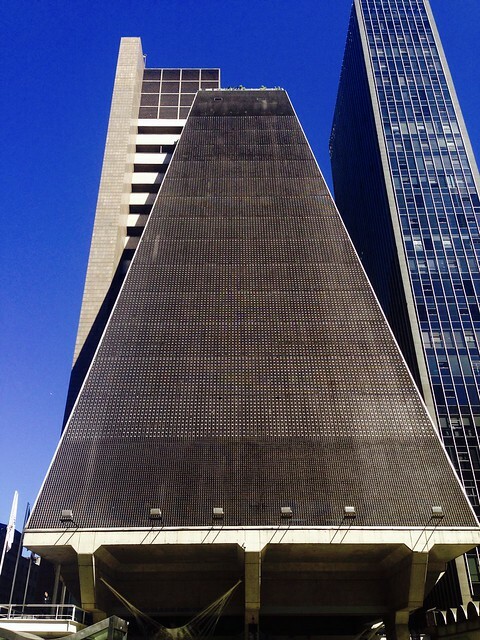 We pretty much walked up and down Paulista to check out some of the 18th century buildings, and also admire some of Brazil’s crazier contemporary architecture, like the glass pyramid building. We also ducked into a city park for some lovely respite from the concrete jungle. It has an odd mixture of couples making out with little kids playing around the many playgrounds within the park. Around 5 or so, we were done with the walk, and decided to head back to Perdizes for dinner, because there are many sushi options around. We took an uber from Paulista back there. Sao Paulo roads are pretty insane, as I watched the Uber driver follow the GPS. 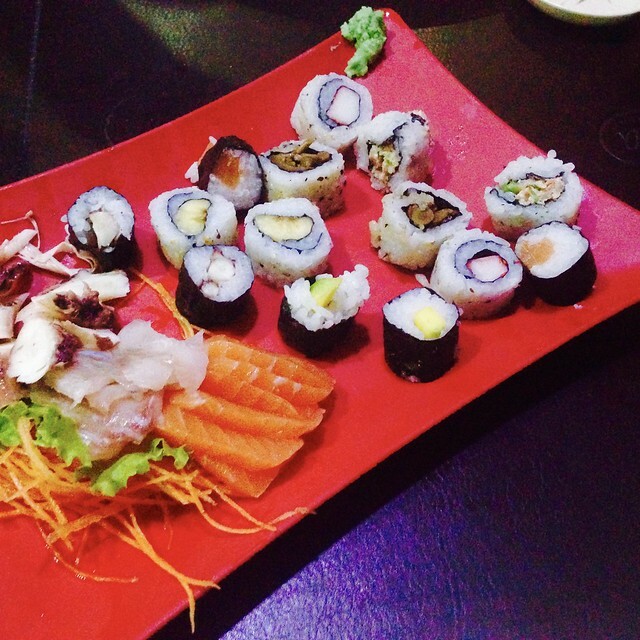 We hung out in our room until we tried a Japanese sushi rodizio (all-you-can-eat) across the street from our hotel. Our lack of Portuguese language skills and crappy mad gesturing meant that there was quite a bit of mis-communication. We ended up having a rather starch-heavy meal, which was quite a Japanese interpretation of Japanese food. It’s not the end of the world, and it also just costs us $40 for two people, so can’t complaint.